Welcome Home Martinez Lopez Family! The Martinez Lopez family lives in the ‘Jose Sulaiman’ community of Juarez, Mexico. Samy works as a waiter in a restaurant and earns about $33 per week to provide for his family. Jaqueline stays home to care for their two children who are too young to attend school. They had been living in a home made from used plywood and tarps with a dirt floor and a leaking roof. 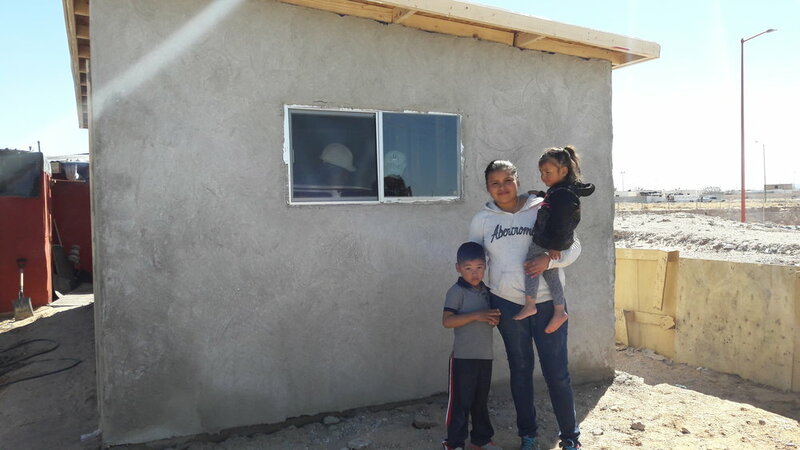 But now, thanks to your kindness, they have a brand new stucco home! Samy asked that we tell you: “Thank you for this blessing that will keep our family safe, warm and dry. God bless you!” Thanks for supporting the mission of Homes for Homes and changing the lives of the Martinez Lopez family!